Chemical defense plays a vital role in protecting people and countries from the devastating effects of chemical attacks. Coming under the umbrella of chemical, biological, radiological and nuclear (CBRN) defense, it establishes the protective actions to be take in situations where chemical hazards may be present. 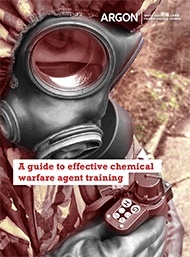 Within both military and non military agencies, chemical warfare agent training provides individuals with the technical knowledge and practical expertise to detect and, as appropriate to the mission, avoid, protect themselves or carry out decontamination against chemical threats. Therefore, it is crucial that training scenarios can realistically replicate the situations that individuals might face in the future – whether in the context of warfare, a terrorist incident, or another scenario. Discover how each CWA training approach can be best employed. Fill out the form and get your copy now.